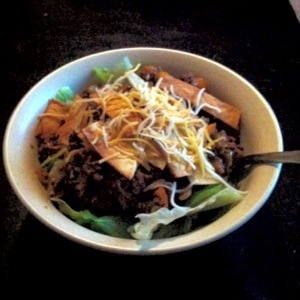 I’m sick of thinking I can’t eat what I want, so I went on a rampage and had a taco salad that I love. And I wanted to have carbs on it, so I did. Sometimes you just have to say, hey, I want to eat a greasy taco. After we cooked up some ground beef with taco seasoning, onions, and orange peppers, I decided to cut flour tortillas into strips. 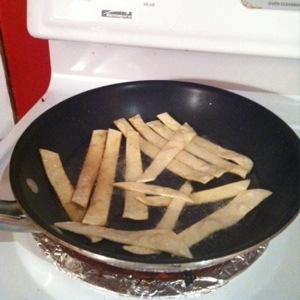 On the stove I heated some vegetable oil in a pan. 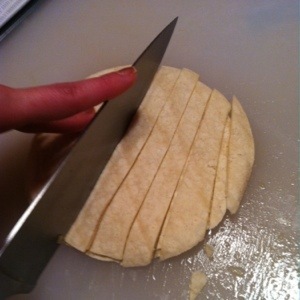 When it started to bubble slightly, I dropped in a few strips of tortillas. I cooked them for less than a minute a side, just so they were golden brown. Then I let them dry on towels and seasoned with a dash of salt. Topped some iceberg lettuce with the taco meat, some avocado, fresh diced tomatoes, and the tortilla strips. Delicious! Now where’s my margarita?